We are excited that you will be joining our Fordham Family! We invite you to discover the SOUL of Fordham by taking part in our diverse activities that engage both the mind and the heart. Our thriving student-led programs include liturgical and music ministries, spiritual retreats, and service projects with the Pedro Arrupe Volunteers. Join our Christian Life Communities to nourish your faith and explore Ignatian spirituality, or take advantage of our multifaith ministries including Muslim, Jewish, Orthodox, and Christian student organizations. 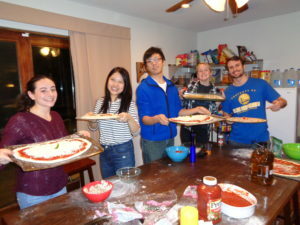 Campus Ministry is committed to enriching the spiritual and religious life of all students, of any faith or background. Campus Ministry wants to encourage our new students to join in the life of our community by participating in the following highlighted events and more! A Mass celebrated to welcome you and your family to our Fordham community. 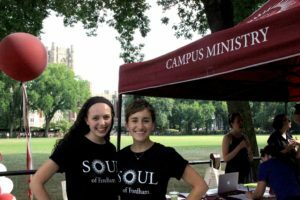 Lincoln Center | Sunday, August 27, 3 p.m.
Rose Hill | Sunday, August 27, 5 p.m.
Come to the annual club fair and look for our tent to meet students who are a part of Campus Ministry. Find out about our programs and ways to get involved. A time honored tradition among Jesuit Institutions, the mass of the Holy Spirit is an opportunity for us to pray for guidance and inspiration from the Holy Spirit for the upcoming academic year. Lincoln Center | Thursday, September 7, 12:30 p.m.
Leave campus for the weekend and build community with other freshman at our beautiful retreat house, located in Goshen, NY. Be sure to stay connected with Campus Ministry throughout the year! We are thrilled to welcome you! Ours is a culture that fosters mutual respect, compassion, a habit of reflection, and an openness to transcendent truth and love. We look forward to meeting you.